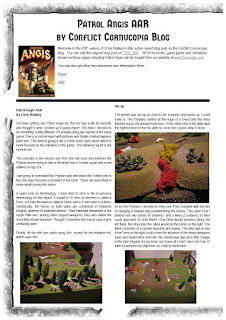 Patrol Angis has been out for a couple of months now and its now all over the world and being played by 15mm science fiction wargamers. One person who has taken a real shine to the game system and has a lot to say about it is Chris Walkley who runs the Conflict Cornucopia blog. He has posted up a detailed 'After Action Report' an AAR which takes the reader through one of the scenarios in the book turn by turn looking at the mechanics and it features a good number of photographs as well. Its a good read and will be most useful to those considering the game for their own collection. You can read his post on his blog HERE. I also realise that a post that length can be a little daunting to read on the screen in scroll format so I have taken the chance to create a PDF in book layout with the photos for you all to read at your leisure. It can be downloaded for free from our Dropbox HERE. 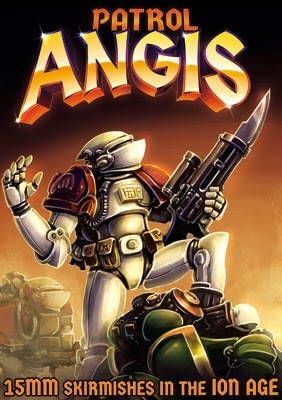 If you are keen on Patrol Angis you can purchase it as a book or a game pack with miniatures. Go HERE and see links for other resources and blog posts. 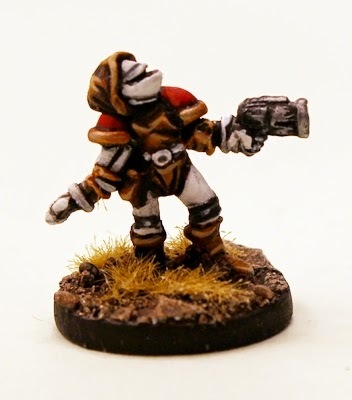 Either way you choose to purchase Patrol Angis it always comes with the unique Knight Errant 15mm miniature that you can only get with it and of course the current monthly free miniature too. Excellent!